Bread boxes are an important kitchen essential, particularly for anyone who loves to bake or just enjoys eating baked goods. A bread box keeps your bread and pastries from going stale, and many of them are also stylish and add to the decor of your kitchen. Bread boxes not only keep your pastries and bread tasting better for longer, but they also help prevent waste and even help you save money. 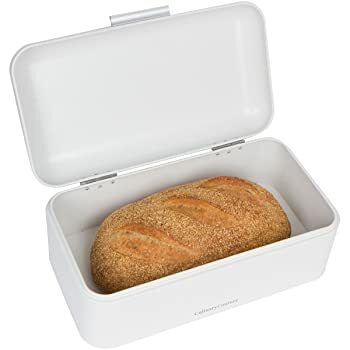 Although there are tons of great bread boxes on the market, we’re going to recommend our personal best bread boxes that we'd use in our kitchen. This affordable and easy-to-use bread box is perfect for a small kitchen. 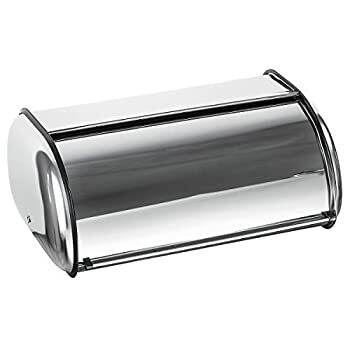 It has a simple clear design that would look nice in any home, and is is sized to fit one loaf of bread. The design of the box expands up to 11 inches so that the bread fits in snugly. The box has two adjustable air vents on the side, so you can decide how much ventilation you need depending on the type of food you are storing. This bread box is also completely dishwasher safe, which makes for very easy cleaning. It comes with a bread board, so you always have a place to slice your bread. We like the simplistic design of this bread box and think it would fit perfectly in anyone’s kitchen. This bread box is one of our favorites for dedicated bakers. It has a very sleek, high tech look that would fit right in with any modern kitchen and look nice sitting on your counter. It has a convenient top swinging door that makes it easy to load and unload your loaves of bread. It is relatively large and can hold about two loaves of bread, depending on what you would like to store. This stylish bread box has a unique construction made of acrylic and bamboo, which creates a soft wood finish that looks very elegant in the kitchen. The door is well constructed and easily slides open and closed, allowing you to see what is inside your bread box. The design is very durable and will last you for years. This bread box is fairly large, and generally holds as much as two loaves of bread or many pastries. It is not particularly tall, so you may need to cut your bread to fit the shape of the box. The bamboo is sealed tightly enough to keep mold out, but it still has some ventilation to allow air to flow through. The smooth surfaces are fairly easy to clean, but must be done manually. This bread box is quite affordable given the high quality of the construction, and the brand even offers a two year warranty. While it is ventilated, it may be problematic for very dry climates. This minimalistic bread box is perfect for anyone who needs tons of storage. 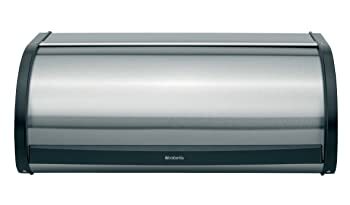 It is huge and very durable, as it is made of stainless steel that is rust-resistant. 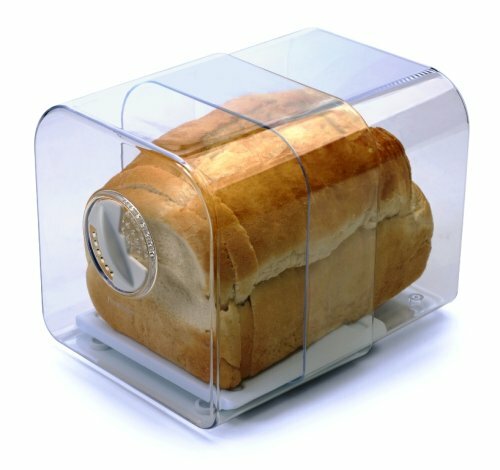 It has a large amount of bread storage space, and it is very easy to open and close, with a simple top-closing lid. The design is very minimalist and would work in any kitchen. It has an appealing rectangular shape with curved edges, and it comes in either an ivory or a turquoise color. The stainless steel construction can be quite heavy. This large and highly durable bread box is great for those who want a real investment piece for their kitchen. The box is huge, with enough room for two large loaves of bread, and it is made with stainless steel. The door slides open to minimize space, and the construction of the box is quite strong - it even comes with a ten year guarantee. It comes in many different colors and finishes, such as black, silver, red, matte steel, and more. Many people choose to just store their bread or pastries in a plastic Tupperware case or even a plastic bag. However, this usually results in the food going stale or moldy, particularly if you live in an area that is prone to high humidity. A bread box also adds storage space to a small kitchen. This is particularly helpful if you live in a studio apartment or other small space where you may not have much cabinet space to store your food. By using a bread box, you can turn a counter into an additional storage area and have more room for groceries. 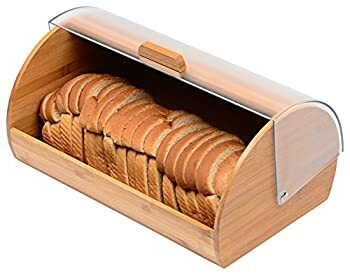 By keeping your bread fresher, a bread box will also help you save money, because your food will last longer and you won’t need to throw anything out. Bread generally takes two to three days to go moldy when it’s out in the open, but if it is in a bread box, it can last as long as a week. The bread box also is slightly ventilated to prevent the bread from drying out. If you are purchasing bread only once a week instead of multiple times per week, you can save huge amounts of money. When searching for a bread box, there are a few things that we recommend you look for in order to find the best one for your needs. The ideal size of your bread box will be big enough to store enough bread and pastries for your family, but not so large that it takes up space unnecessarily. If you live alone or with one other person, you’ll probably need a much smaller bread box than a whole family would. It is very important that the bread box is sealed tightly enough to keep out mold, but still has some ventilation to prevent the pastries from going stale. The climate that you live in can have an effect on this. If you live in a dry climate, look for a bread box with more ventilation, but if you live in a humid climate, focus on a bread box that's sealed tightly. For many people, aesthetics are also very important when choosing a bread box. There are many stylish versions out there on the market, ranging from futuristic metallic boxes to classic wooden ones that look like they could be straight out of Julia Child's kitchen. While the design of the bread box generally has little effect on its functionality, you’ll want to choose one that fits your tastes and that goes with the existing decor in your kitchen. There are a few things to take into account when using a bread box. They tend to be bigger than consumers expect, so you’ll want to stock up so you have enough to fill it. However, be sure to leave some room in the bread box so that the air can still flow and the bread can stay fresh. Generally, bread boxes are not designed for tall loaves or baguettes, so you may need to cut your bread in half to make it fit. You should also take any plastic coverings or other packaging off of the bread or pastries before you store them, as the bread box is specifically designed to maintain good conditions for the food without any additional packaging. There are plenty of great options for bread boxes on the market, ranging in style, size, and price. Overall, we recommend all of these bread boxes for any pastry lover. They each have pros and cons, but we like the Brabantia in particular as an investment piece, or the Blue Donuts for an affordable yet very stylish option.